Weaning, simply put, is the process of gradually introducing semisolid and solid foods and reducing the frequency of breastfeeding. Weaning is ideally started when the baby is around 6 months. Since a baby is used to mother’s milk from day one, it becomes difficult to stop it suddenly one day. The process of making the baby eat semi-solid and then solid foods should be gradual and the progression should be slow ( over 4-6 months). 1 . Have your meal along with the baby, and make your child eat the same foods that you are eating, so they watch and understand that they should also eat the same thing. This way he/she will learn to try and taste new things. 2 . During the day, start offering the child soups, juices and finger foods in cups/sipper/bowl and spoon instead of a breastfeed for each meal. 3 . Do not feed using a bottle. You might end up just having the baby hooked to the bottle instead. 4 . Feed your baby properly at the time of dinner. Make sure that he/she has had enough food. This is half the battle won. 5 . 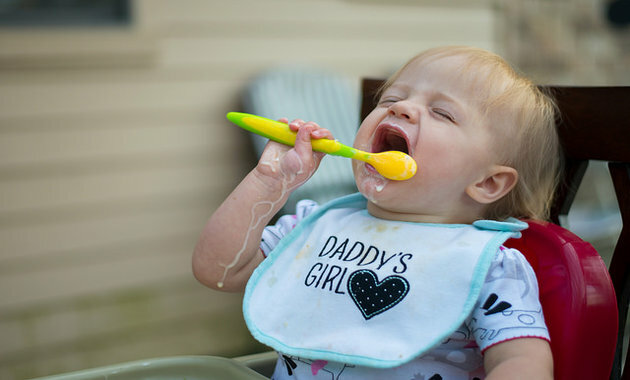 Gradually offer the child more and more solid foods starting from the age of 9 months; a 1 year old can eat all solid foods that are not too spicy. 6 . Give a warm bath to the baby and put on a fresh pair of clothes and diaper at night. A warm bath in general calms the baby and induces sleep. A fresh diaper will ensure that the baby does not wake up in middle of the night due to moist nappies. 7 . When the baby wakes up in the middle of the night, if possible, let the father/grandparents handle the child. This might help the baby understand that he/she is not going to get breast-fed at this time. This reinforces stopping the nightly breastfeeds, which are the most difficult to stop. 8 . If nothing works you will have to breastfeed him/her and this will just slow down the process of weaning. Most importantly, be patient and remember that this phase is temporary and soon your baby will get into the habit of accepting foods other than breast milk. Stay Healthy, Stay Happy with 1mg, India’s leading online medical store! ← What Causes Diabetic Neuropathy? Is it Reversible?